At a first glance, Lingering Radiation (2008), made by the American artist elin O’Hara slavick, looks like a black and white photograph of exploding fireworks. The image shows a black background with brightly illuminated sparks clustered in petal-like shapes towards the top and the sides of the image. Yet, as the title of the work suggests, these are no fireworks – although the work is the indirect product of an explosion – nor is this really a photograph. Instead, Lingering Radiation is an autoradiograph: a contact print produced by putting radioactive material directly onto x-ray film. The radiation released from the material exposes the object on the film when it is developed. This connection between radiation and photography goes way back: notably, scientist Henri Becquerel initially discovered uranium’s radiation by placing a piece of the material onto a photographic plate, the outline of which he found transferred onto the film after developing it. More recently, several artists such as Julian Charrière or Shimpei Takeda have experimented with radioactive material in their work, exploring the multiple and intersecting meanings of photography, exposure, time, and light within the contexts of local nuclear issues. Their works is a bit like an autoradiograph as well: film is exposed to radioactive material (soil, in the case of both Charrière and Takeda), so as to capture the traces of radiation left behind. The final result alludes to the peculiar temporality of radioactivity, and especially its longevity, as they push the supposed past into the present. The radiation captured in Lingering Radiation stems from fragments of a tree that used to grow in Hiroshima. 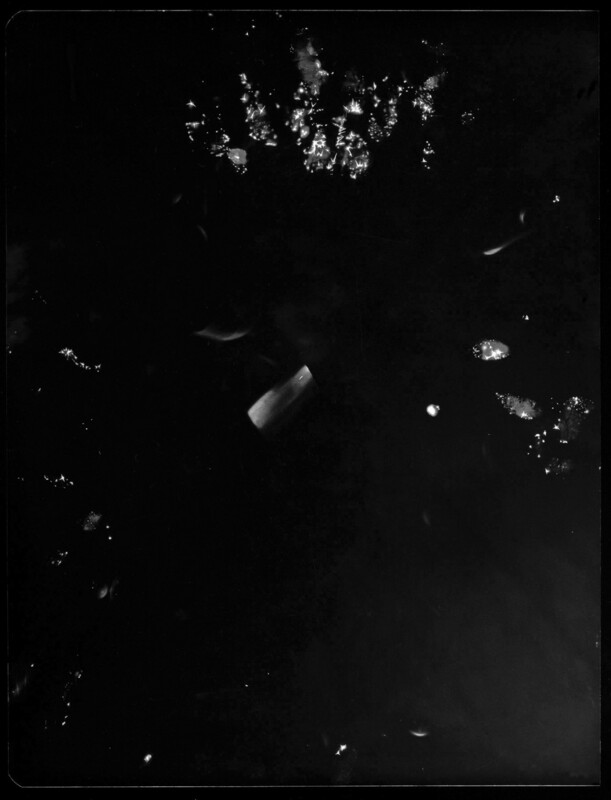 The pieces were put on film by O’Hara slavick, as part of the work she produced during her stay at the Hiroshima Peace Memorial Museum (HPMM). This museum was built to commemorate the atomic bombing of Hiroshima in 1945 by the United States – the original source of the radiation on the tree. The fragments of the tree are preserved in the HPMM archives, together with 90.000 other objects. The dazzling burn the fragments left on Lingering Radiation seems simultaneously elegant and brutal, foregrounding the sharp contrast between the irrevocable, stark violence of the atomic bomb, and the gentle, intimate gesture implied in the tree fragment’s presence within the archive. The pieces were brought to the HPMM to be kept simply because they were touched by the bomb – a touch that, as the work attests, remains felt until this day. That we cannot recognize any particular shapes within the radiation imprinted on the film seems only right. The bright colour but unrecognisable form of the tree fragments emphasizes radiation’s ambiguous tendency to illuminate and deform simultaneously. Yet the abstractness of the work leaves also some room for uncertainty: are these traces really produced by the radiation on the fragments? Although it is possible to produce more focused and bright autoradiographs (see for example those made by Masamichi Kagaya or the archive work of Susanne Kriemann), O’Hara slavick has explained that she did not know what the outcome would be when she placed fragments out of the archives onto x-ray film and whether the radiation would be caught on the material at all. It is a process of which the outcome is uncertain and beyond the artist’s control. Lingering Radiation was the only one out of six autoradiographs that rendered visible more than just very light traces of radiation, and it is not impossible that something went wrong in the process. Knowing this, the petals suddenly also suggest fingerprints, hinting at the film’s potential contact with a body existing in a world with increasing levels background radiation. In a blogpost on the ubiquity of imperfection in the field of contemporary photography, philosopher and critic Bernd Stiegler identifies in the current moment a “discovery of photography as a visualization process of the unexpected. Photography is intended to show and materialize in images something that could not have been planned in advance.” The strategy of imperfection in photography, and in works like O’Hara slavick’s, becomes not just an aesthetic, then, but it also very much speaks to a particular process of making. Lingering Radiation is the result of an process that can only be controlled so far, taking the form of an unexpected collaboration between radioactive material, film, and the artist herself. Ultimately, the uncertainty about whether we are seeing the tree’s fragments imprinted on the film or something else “that could not have been planned in advance” only adds to works moving quality, I suggest. Creating autoradiographs with objects from the HPMM archives means surrendering to a form, or a process, without being able to control the outcome, without knowing what will become visible and what will remain hidden. Lingering Radiation does not obtain an indelible memory of the past, nor is it capable of crystallizing the bomb’s long-term effects. It does not need to: its very materiality already speaks to the diffusion of radiation, the difficulty of grasping its workings. In tracing, imperfectly, those fragments of the tree, O’Hara slavick paradoxically encourages us to stay with what has remained – to linger with radiation ourselves.